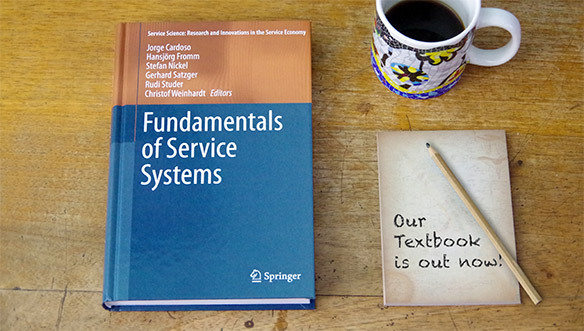 This textbook is an introduction into service systems for students, teachers, researchers, and practitioners. It has been written by leading experts in the field from the Karlsruhe Service Research Institute (KSRI), Germany. The targeted university audiences are undergraduate and graduate students in business economics, information systems, service engineering and management, and computer science. Foundations of Service Systems: Service-oriented Societies. Basic Principles of Services. Services and Goods. Electronic Services: Perspectives on Services. Services as the Automation of Activities. Services as Programming Paradigms. Web Service Technologies. Cloud Services. The Internet of Services. Service Innovation: An Introduction to Innovation and Service Innovation. Managing Service Innovation - Selected Methods. The Servitization of Manufacturing. Service Design: Introduction. Design Process. Design Methods. Service Semantics: Cloud Services. Foundational Technologies. Linked USDL. Service Search Algorithm. Service Analytics: Information Gap. General Notion of Analytics. Analyzing IT Services. Other Methods. Tools and Software. Service Optimization: Introduction. Operations Research Foundations. Operations Research Problems. Solution Methods. Service Markets: Microeconomics. Market Engineering. Testbedding Service Markets. Pricing Strategies. Complex Service Networks. Service Co-Creation: Key Concepts of Service Co-Creation. Customer Relationships. Customer Participation. Research Outlook: Advanced Topics. Service Network Analysis. Service Level Engineering. Service Science: Research and Innovations in the Service Economy. You can get free access to the textbook within the KIT network via SpringerLink.